Box braids are as popular as ever and it’s easy to see why. They’re gorgeous, versatile, and practical. As you probably know, box braids get their name from the box-shaped parts that are used to divide the hair into small sections for each braid. There are so many different ways to wear box braids: it’s impossible for them to ever get boring. 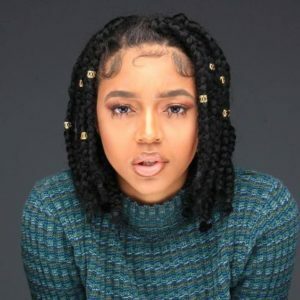 Short box braids are particularly great for ladies who are growing out their natural hair who have reached what some refer to as the “awkward phase,” that in-between length that’s neither long or short and a little more difficult to style. 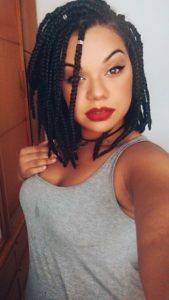 While ultra-long box braids are a popular choice, there are many benefits that come along with short braids. 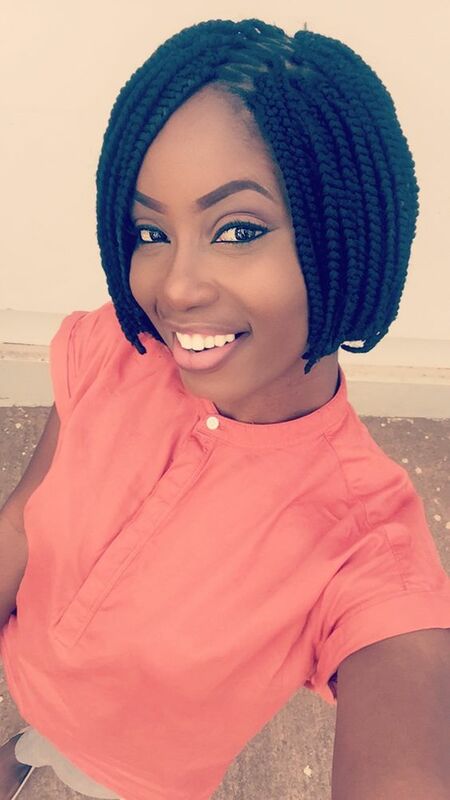 One of the pros of short braids is that they require less braiding hair, so they often feel lighter on your head. This also means you won’t need as many packs of braiding hair to complete the style. 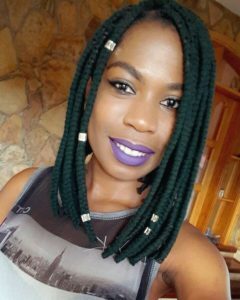 Short braids also take less time to install and take down than longer braids. 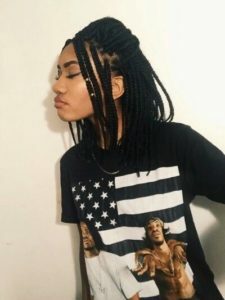 While you may not be able to achieve as many styles as with long braids, short box braids come with a surprising amount of styling versatility. Ponytails, half up half down styles, and even some updos are achievable on short braids. They’re also less likely to put too much tension on your roots, which is important for the health of your hair. However, it’s always important to make sure your braids aren’t too tight, regardless of how long your braids may be. 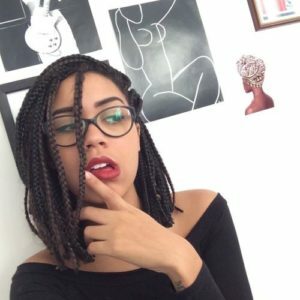 You can do short box braids with or without added hair. The length can range from the classic chin-length bob, or slightly shorter or longer. 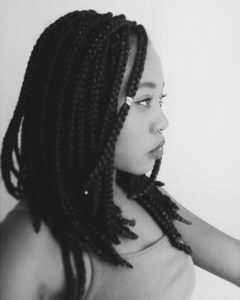 If you’re adding hair, Kanekalon hair is a great choice for box braids because it provides a smooth finish. However, you can also use acrylic yarn; this is a particularly good choice if you want your braids to be a bright color. 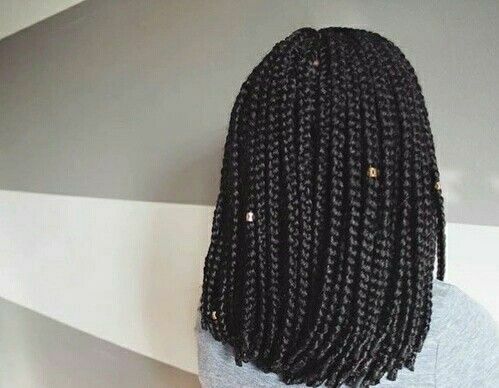 If you add braiding hair, make sure the braids are at least an inch or two longer than your natural hair so that you’ll be able to burn the ends to seal them. 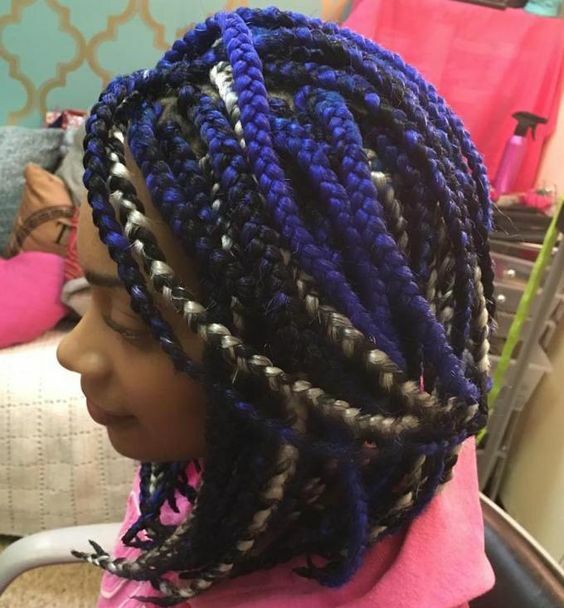 If you’re braiding your own hair, you can use ouchless rubber bands to secure the ends. 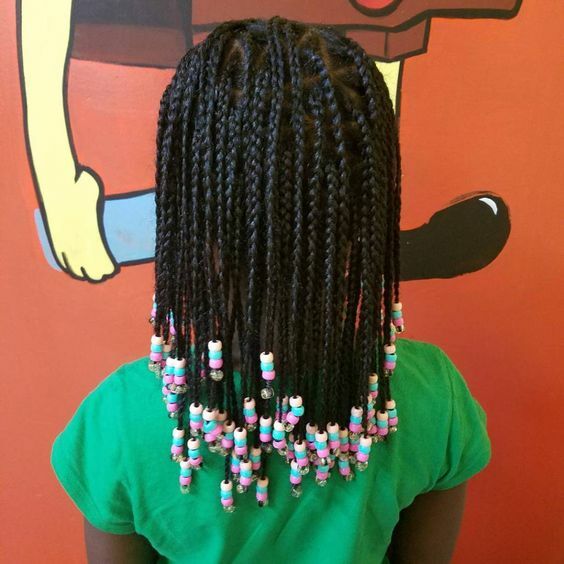 Adding beads to the ends of your braids is a great way to add some flair. 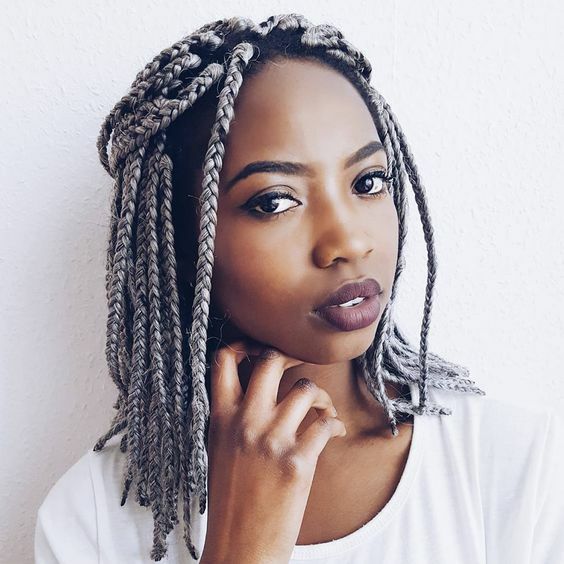 Here are 35 gorgeous ways to wear short box braids. 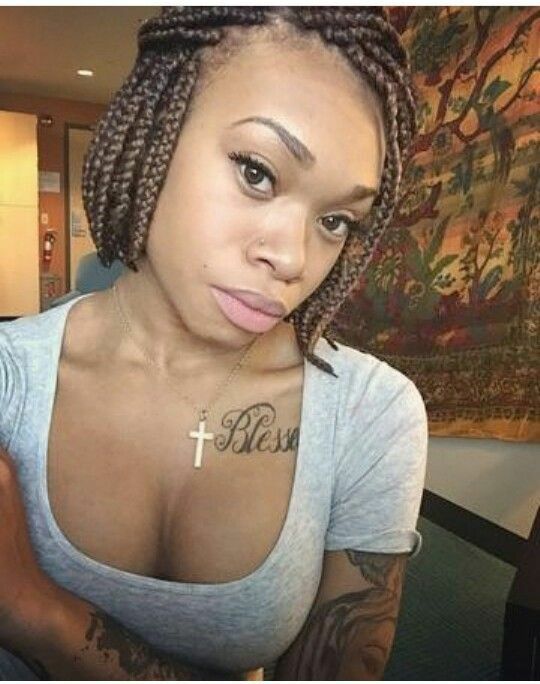 The classic bob is one of the most popular ways to wear short box braids. You really can’t go wrong with this look. This is a nice, low-maintenance style that never gets old. 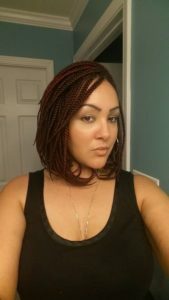 These cute red box braids are a great choice if you want a style that combines a bright, bold color with the classic beauty of short braids. 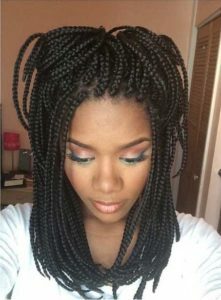 These pretty bob-length box braids feature a subtle two-toned color that really makes them pop. Style them with a simple side part, and you’re ready to go. 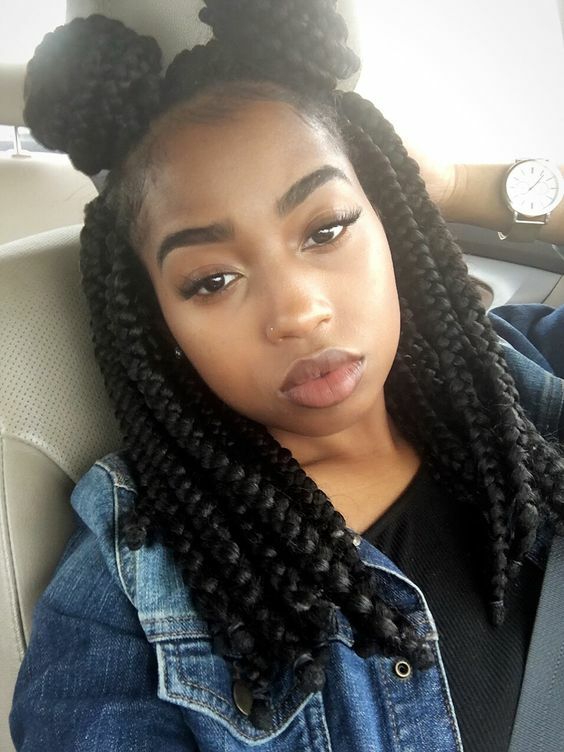 These medium-sized box braids fall right below the shoulder and look great styled into this cute half up, half down double bun style. These sleek, shiny box braids fall right around the shoulders. This is a great length that allows you to wear many styles, including ponytails and half up, half down styles. This cute box braid bob features a zig zag part that gives this classic style a unique look. 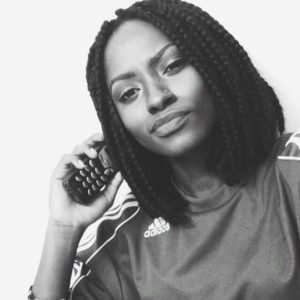 These short box braids are the perfect protective style if you want braids that are low-maintenance and lightweight. The pretty light brown color adds a nice touch to this style. 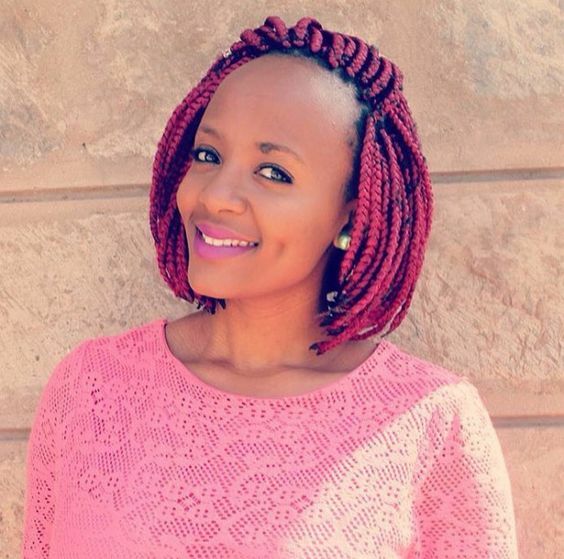 You’ll be pretty in pink with these gorgeous bob-length box braids. The color alone is sure to turn heads. 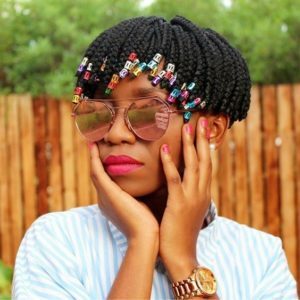 Hair accessories like silver cord and beads are a great way to jazz up braided styles like these classic, short box braids. 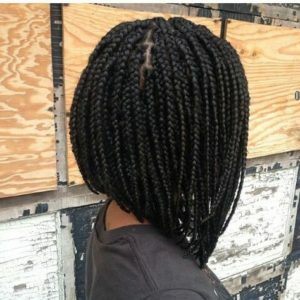 While box braids are typically done using Kanekalon braiding hair, yarn braids have become more and more popular over the years. Acrylic yarn is a great choice for box braids because it’s available in a wide range of vibrant colors, like the ones pictured here. This classic box braid bob is a great way to wear short braids. A few silver beads help embellish this simple, pretty style. 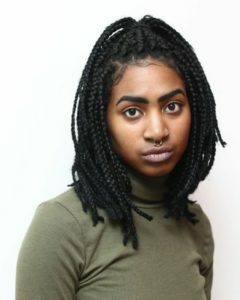 These box braids fall right beneath the shoulders, which is an ideal length for styles like this effortless high ponytail. 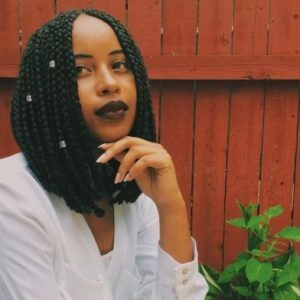 Box braids are also a great way to style your natural hair. These pretty beaded box braids are a perfect style for the little naturalista in your life. If you prefer slightly thicker braids, these short box braids are a great choice. Add some gold beads for a little flair. 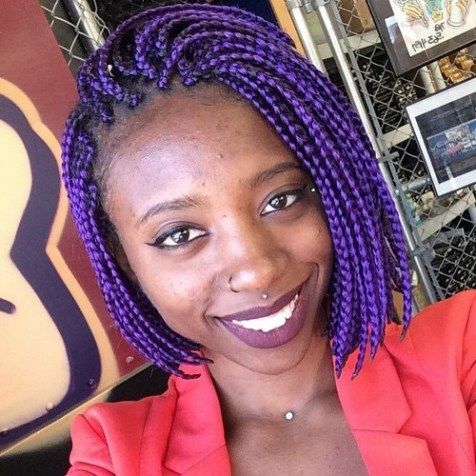 These short purple box braids are a great way to make a statement. 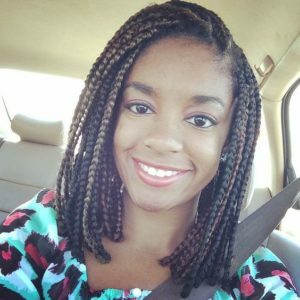 This bob is a fun, funky way to wear short braids. 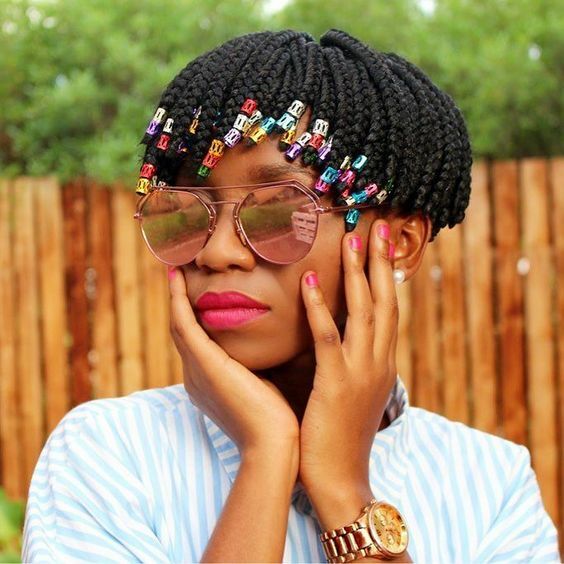 These stunning ultra-short box braids are adorned with colorful beads. 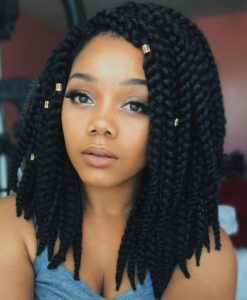 Braids this short are rare and sure to stand out. These lavender box braids are a great choice if you want a bold color that’s also soft and ethereal. This is the perfect summertime style but it works any time of year. You can never go wrong with classic box braids. 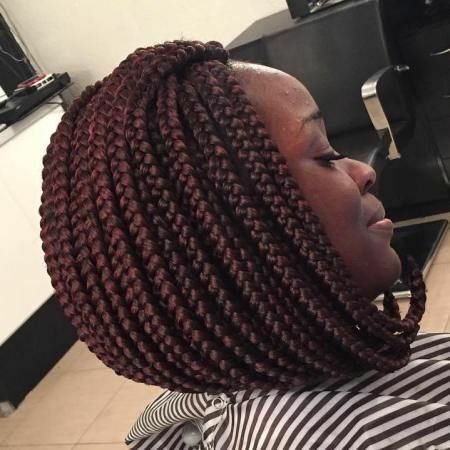 These shoulder-length braids are sure to flatter any face shape. These gorgeous box braids are a nice, balanced shade of green: bold but also subtle. 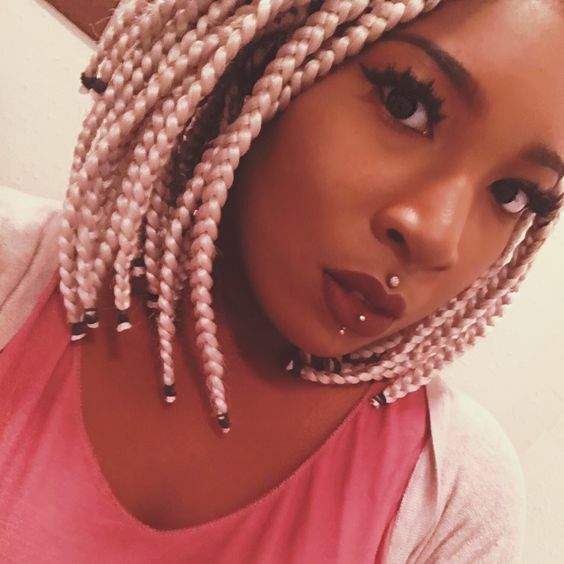 Gold beads help the color of these yarn braids pop. 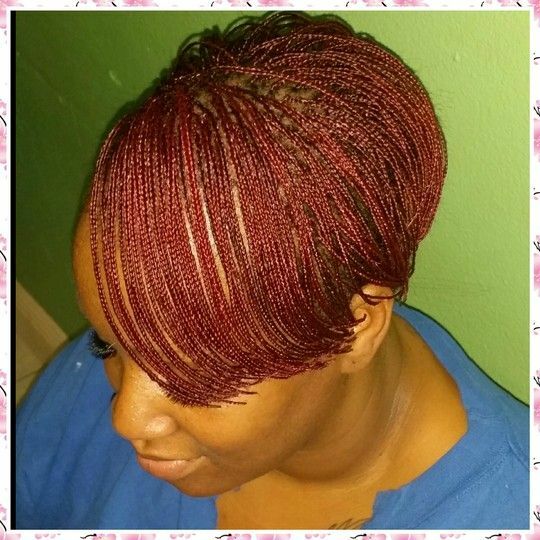 This pretty shade of red adds a twist to the classic braided bob. Styled with a simple side part, you can’t go wrong with this look. 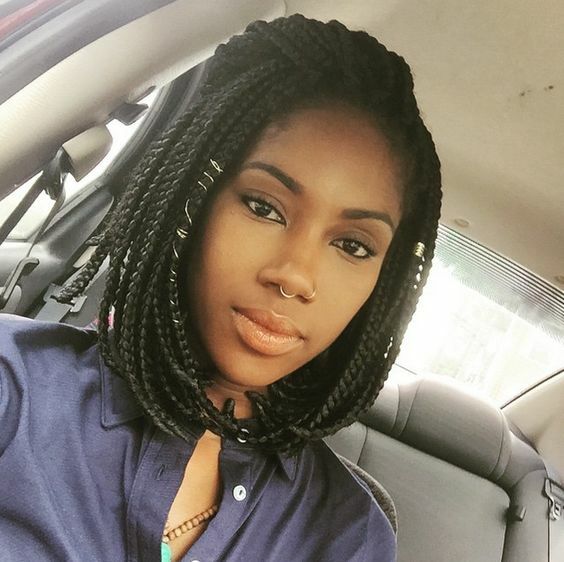 This half up, half down ponytail is a great way to style box braids. 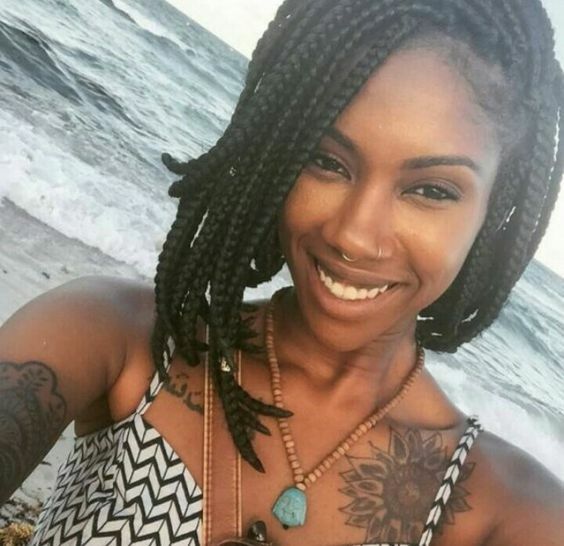 The best part about this style is that it looks great on braids of any length. Getting micro braids requires a lot of patience (for both the installation and the take-down). Luckily these short red micro braids are less time-consuming than their longer counterparts. Grey hair used to be something women went out of their way to avoid, but it’s become trendy in recent years: particularly in protective styles that allow you to go grey temporarily, like these cute, grey box braids. These pretty box braids are styled into a stacked bob: shorter in the back and longer in the front. If you prefer the stacked bob look to the classic, more even-length bob, this is a great a choice. 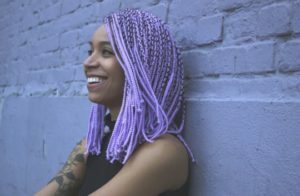 If you’re growing out your natural hair and you feel stuck in a rut, a fun protective style could be just what you need. Brightly colored braids like these yellow box braids could be just what you need. 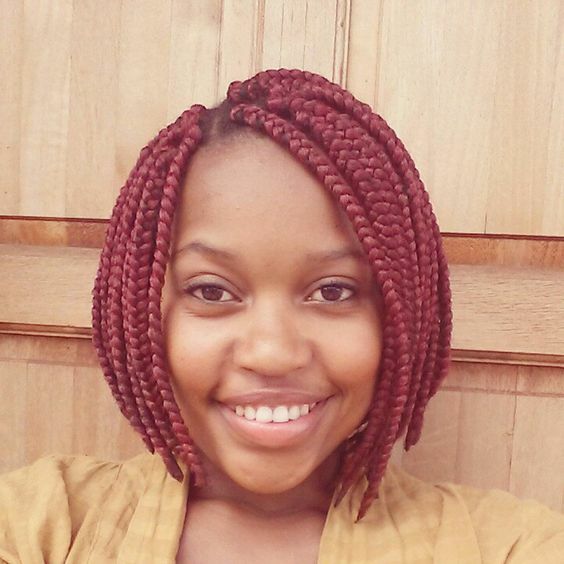 There’s just a hint of red in these bob-length box braids which creates a nice, subtle highlighted effect. The long bob, or “lob,” is a great choice if you want a little more length to play with. 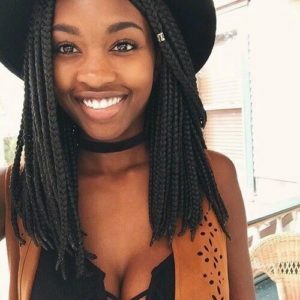 These braids fall right around the shoulder and look great when paired with a hat like the one pictured here. 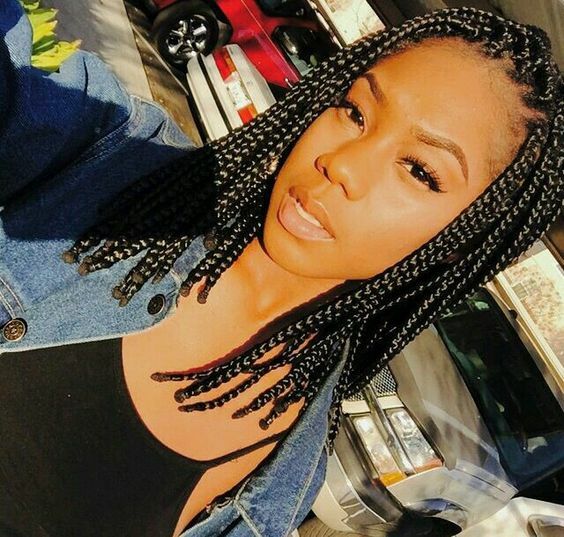 These shoulder-length box braids look great in a half pinned back style. Leave a few braids out in the front to frame your face and accessorize with a few gold or silver beads to complete the look. 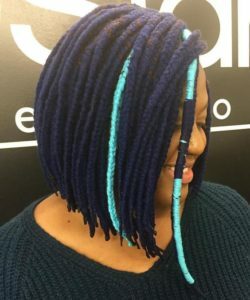 These purple, blonde, and black box braids create a unique multi-colored effect that’s reserved only for the bold. An asymmetrical bob is one way to put a twist on a simple style. 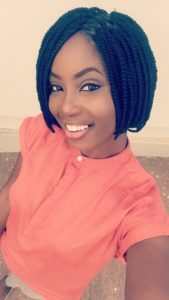 This is a great choice if you want a braided bob that’s slightly different from the classic look. 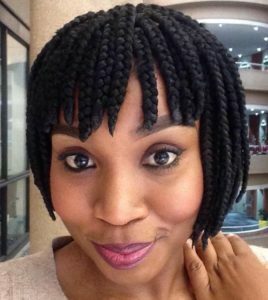 This cute, short box braid bob includes bangs: something you definitely don’t see every day. This extra detail breathes new life into the classic braided bob. This is another great stacked bob look. The subtle reddish-brown color really makes these braids pop. 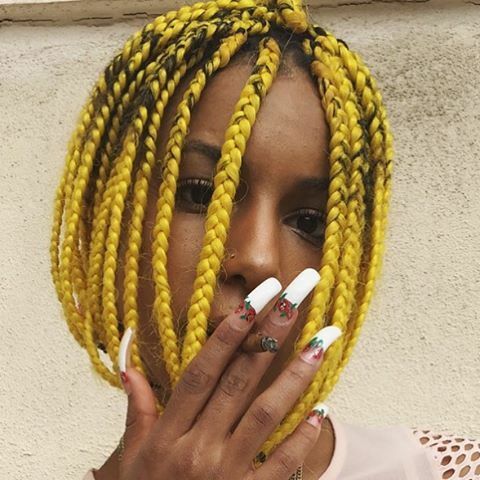 These beautiful braids are a little chunkier than averaged-sized box braids. They’re also a great length: falling right around the shoulders. A few gold beads and a side part are all you need to achieve a style like this one. These gorgeous shoulder-length box braids are simply timeless. A few silver beads are all you need to accessorize this look. 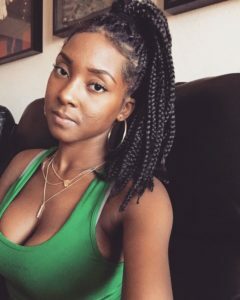 This style was one of Brandy’s signature looks in the 90s, but it’s just as cute today, proving that box braids really are timeless.